Classic cocktail onions pickled with blazing habanero pepper slices. These zingers have a large and devoted following. Killer in chili! Heat level 10 on a scale from 0 to 10 (from mild to very hot) Jar size 16 oz. Heat level 0 on a scale from 0 to 10 (from mild to very hot) Jar size 22 oz. A top seller for years! A great idea: one of these savory spears plus a small slice of pecorino romano wrapped up together with a thin slice of prosciutto - simply delicious! Or try this all-American: take a slice of your favorite deli meat (smoked turkey is our favorite), blot the excess juice from the slice, slather with whipped cream cheese, lay two spears of Black Sheep Pickled Asparagus in the center, roll up, insert toothpicks every inch or so, slice between toothpicks to create little individual spirals of delight! Click on product name for picture. This recipe works well with our Dilled Green Beans, too! Classic Bloody Mary garnish or great just right out of the jar! 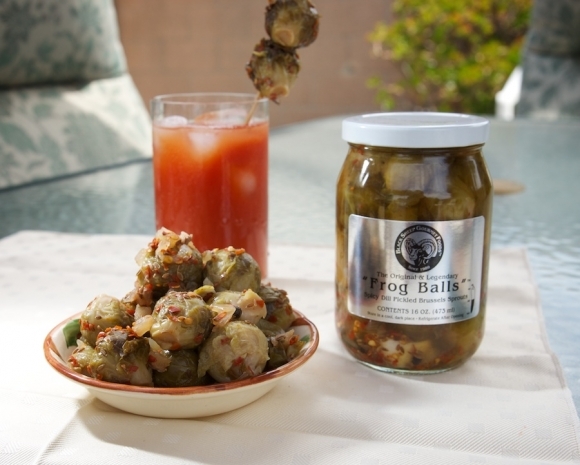 A classic, crunchy treat on any appetizer tray or in any Bloody Mary! Delicious in green salads! A savory surprise chopped into potato salads or finely diced in tuna or egg salad. Or try this all-American classic: take a slice of your favorite deli meat (smoked turkey is our favorite), blot the excess juice from the slice, slather with whipped cream cheese, lay two Black Sheep Dilled Green Beans in the center, roll up, insert toothpicks every inch or so, slice in between toothpicks to create little individual spirals of delight! This works well with our PIckled Asparagus also. Heat level 10 on a scale of 0 to 10 (from mild to very hot) Jar size 8 oz. Heat level 5 to 6 on a scale from 0 to 10 (from mild to very hot) Jar size 8 oz.